The Adventure trips incessant blessing given by the Mother Nature in this mystic land has presented the unlimited mountains, hills, forests, swift rivers, glacial rivers and astounding natural landscapes. These numerous resources are the best ingredient for the adventure holiday activities in Nepal. Witness the beauty of the natural landscapes of Nepal via various adventure activities in Nepal. Nepal Hiking Trek Pvt. Ltd. offers boundless adventure packages ranging from paragliding, rafting, the bungee to honey hunting and cave exploration. Fulfil your adventurer dream and treat your soul by creating your own brave adventure tale. The presence of steep uphill and downhill along the trail and the presence of whitewater rapids Nepal is an ideal destination to conduct the Paragliding and Rafting along with Bungee. The paragliding from the picturesque destination of Pokhara the Sarangkot witnessing the beauty of Fewa Lake surrounded by the boundless Himalayan range landing in the vibrant Lakeside city of Pokhara would let loose your adventure aspirations. The hawking experience while paragliding too would be the best thing to do while gliding in the sky. 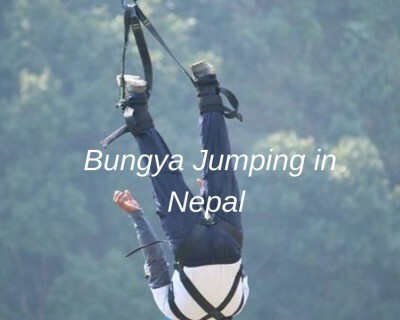 The Bungee in Nepal is completely different than what you are experiencing in most parts of the developed countries. The bungee in Nepal is done from the suspension bridge connecting two giant hills with flowing gigantic Bhotekoshi River down under. The thrilling adventure of Bungee too can be even more thrilling if you wish to do Swing Jump in the same venue. All the spicy adventure trips can be done in the single package put forwarded by the Nepal Hiking Trek company. The white water rapids rafting is also very popular among locals and foreigners in Nepal after trekking in Nepal activity. The rivers like Trishuli, Bhotekoshi, Marshyangdi, Seti and Narayani offers splendid opportunity to encounter the great tides of swift Nepalese Rivers. The choices are there for you to make as the rafting in Nepal could be found from easiest to the strenuous level in terms of risk factor. Other than usual adventure activities like paragliding, rafting and bungee Nepal offers alternative adventure activities like Zip Flying, cave exploration and honey hunting. Zip flying is done in Pokhara while cave exploration can be done in Pokhara, Bandipur and Tanahun. Lamjung district of Nepal is the best place to fulfil your honey hunting dream. The Eric Vallie documentary on honey hunting in Nepal made famous this package. It includes life with the hunters and the daring hunting activity. Therefore, fellow adventure seekers visit Nepal for your holiday and experience all sorts of your adventure dream. Nepal Hiking Trek Pvt. Ltd. would provide you excellent adventure Trips package at the competitive price. Nepal Hiking Trek we offer all Adventure trips in Nepal.